Our desire is to help you move Onward & Upward through relationship and character coaching. Everyone has a story and everyone has stuff in their life. The journey for most of us deals with relationships, whether good or bad, and character plays such an important role in building these relationships. We all need help in these areas no matter what season of life we are in - because not one of us is perfect. Onward & Upward's coaching practices help clients define and grow towards reaching their relationship and character goals. As a Board Certified Christian Life Coach, we use a formulated coaching plan that includes accountability, regular coaching sessions, homework, prayer, and encouragement. We may use books, workbooks, DVDs, assessments, and other tools as well. We know through experience that the need is great and it is the desire of our hearts to serve you, have an impact in your life, and make a difference for God and His Kingdom. My name is Gary Lydic. I was born in Dayton, Ohio and grew up in a very loving family. Most of my childhood memories revolve around playing basketball, my favorite sport, at a neighborhood park. My mom and dad always knew where to find me. In junior high, I was known as “blocky” - whether that nickname applied to the shape of my head or its hardness is still debatable. Thankfully God softened my hard heart when I accepted Jesus Christ as my Savior my junior year in high school at a Billy Graham film. I attended McPherson College, a small college in Kansas, where I played a little basketball and baseball. Majoring in physical education, I had the privilege of serving as the Student Assistant Basketball Coach my senior year. Upon graduation from college in 1971, I headed to Florida where I was hired by Walt Disney World. What I thought would just be an interim position until a high school coaching job opened up became a career with the Disney organization. From pre-opening to the completion of EPCOT Center, I served in management in Transportation, the Magic Kingdom Theme Park, Employee Recreation, and both the Contemporary and Polynesian Hotels. In 1979, I was transferred temporarily to California and WED Enterprises (the design company for Disney), where I had the opportunity to work as a Project Coordinator for EPCOT Center. Disney days were filled with many amazing and wonderful adventures for me. I received opportunities for career development and training that have lasted a lifetime. The greatest opportunity came in 1977 when I met and married the love of my life, Debi, a Disney Girl who worked in the Magic Kingdom giving guided tours. Our family grew from two to four with the birth of our sons, Trevor and Brent. In 1983, after 12 years with Disney, Debi, the boys, and I hung up our mouse ears and made Pasadena, California our new permanent home. During our early days in California, I began playing early morning basketball with another great fan of the game, Dr. James Dobson. Dr. Dobson offered me a job at his young organization, Focus on the Family, while playing basketball in his backyard. Little did I realize the significance of that basketball court offer and how it would impact my life. I served at Focus on the Family for 22 years in Human Resources, Public Affairs, and as Director of Ministry Services. 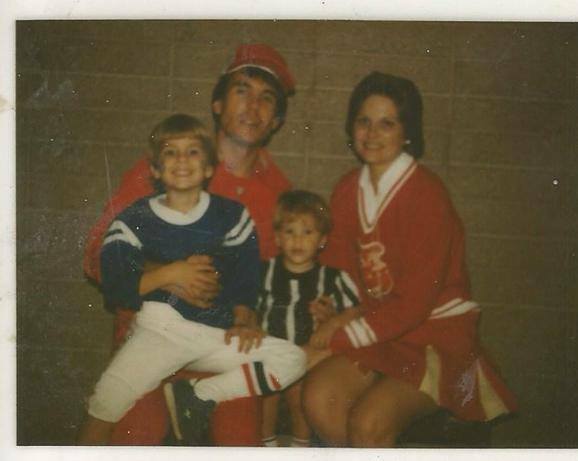 As Director of Ministry Services, I directed the Pistol Pete Maravich Basketball Camps, Single Parent Events, Life on the Edge Tour for parents and teens, Church Relations and events for pastors and families. During my time with Focus, Debi and I again moved our family to Colorado Springs, a place that will always be near and dear to my heart. In 2005, I accepted a position with America’s Family Coaches, a marriage ministry led by Dr. Gary and Barb Rosberg. Debi and I once again pulled up our roots in Colorado and moved to Des Moines, Iowa. I served as Vice President of Development for nine years where I had the opportunity to minister as a “friend” raiser. In 2015, after much prayer, Debi and I sensed God’s call to begin Onward & Upward Ministries, a nonprofit 501(c)3 ministry that focuses on relationship and character coaching for men and their marriages. We are serving others to help them move Onward & Upward through coaching that uses Biblical wisdom and Christ-centered encouragement. My bride Debi and I have been married for over 40 years. Debi serves the women of our church and community as Director of Women's Ministry. She has also completed her certification as a Board Certified Christian Life Coach. We have two sons: Trevor and his wife Kayce, and Brent and his wife Rachael. Providing relationship and character coaching to help others move Onward & Upward through Biblical wisdom and Christ-centered encouragement. To coach others to progressively live, act, and look like Jesus Christ and say the things He would say through the teaching and practical application of God's Word.